Premium Protein Blend (Whey Protein Isolate, Whey Peptides), Whey Protein Concentrate, Cocoa (Processed With Alkali), Natural And Artificial Flavor, Soy Lecithin, Calcium Carbonate, Gum Blend (Cellulose Gum, Xanthan Gum, Carrageenan), Salt, Non-Dairy Creamer (Sunflower Oil, Corn Syrup Solids, Sodium Caseinate, Mono- And Diglycerides, Dipotassium Phosphate, Tricalcium Phosphate, Soy Lecithin, Tocopherols [Preservative]), Sucralose, Acesulfame-Potassium. Mix 1 scoop with 4 to 6 oz. of cold water or skim milk in a glass or shaker cup. Use between major meals and before and after exercise. Read the entire label before use and follow directions provided. Note: To maintain product freshness, store in a cool, dry place (60°F to 80°F). This product is sold by weight. Some settling may occur. Shake container before use. Do not use if pregnant or nursing. Consult a medical doctor before use if you have a medical condition and before starting a diet or exercise program. KEEP OUT OF REACH OF CHILDREN. 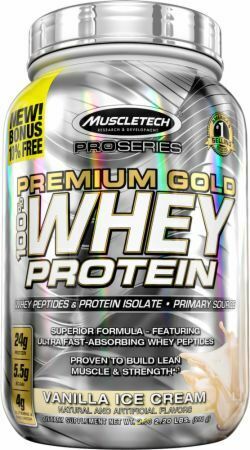 Premium Protein Blend (Whey Protein Isolate, Whey Peptides), Whey Protein Concentrate, Natural And Artificial Flavors, Soy Lecithin, Calcium Carbonate, Gum Blend (Cellulose Gum, Xanthan Gum, Carrageenan), Non-Dairy Creamer (Sunflower Oil, Corn Syrup Solids, Sodium Caseinate, Mono- And Diglycerides, Dipotassium Phosphate, Tricalcium Phosphate, Soy Lecithin, Tocopherols [Preservative]), Salt, Sucralose, Acesulfame-Potassium.